Hi everyone, so today I’m going to write my first blog post. Wish me luck! I’m going to start by saying that I am so excited to start sharing my work and ideas, so here goes. 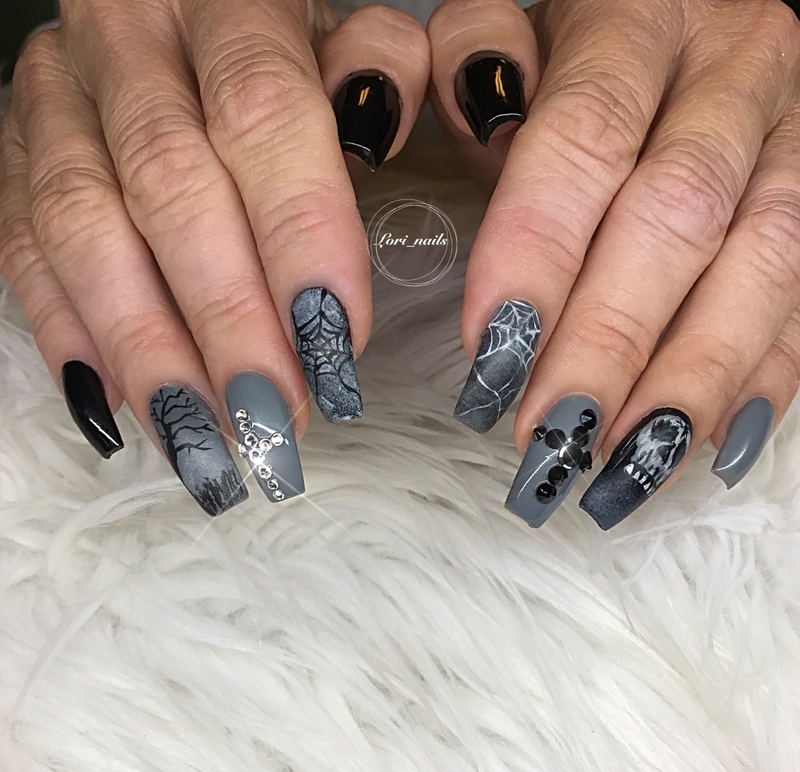 The first design I’m going to share with you is a white, gray and silver leopard design with hombre glitter accent nails. 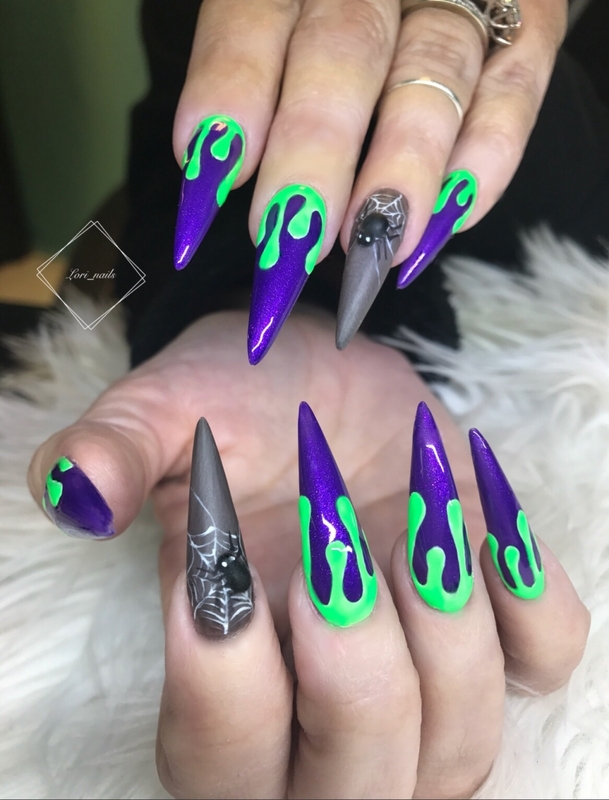 this was done on top of acrylic nails, but if you want to do it on natural nails, prep the gel mani first, with base coat and a strengthener if desired. 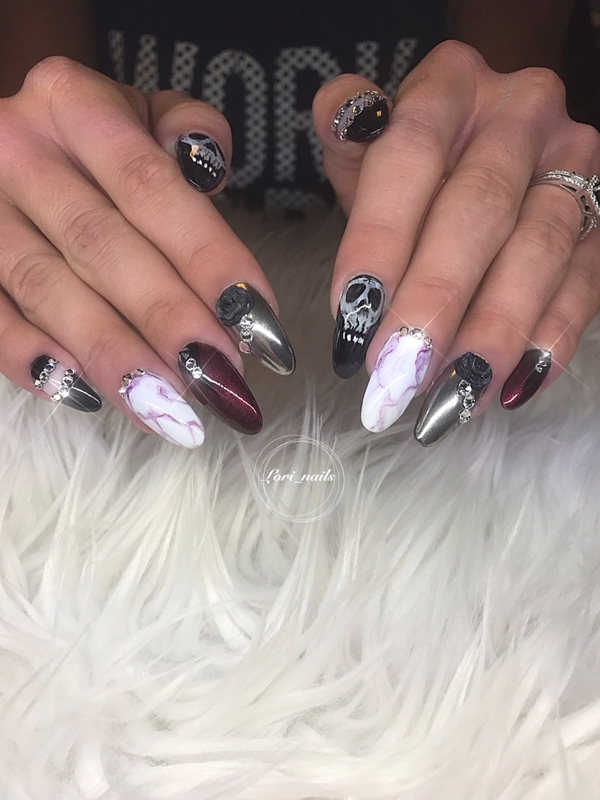 This design was done using white gel polish, ( Gelish arctic white) slate colored glitter and silver glitter. Any brand will do. And black gel play art paint by Akzenz. I love this stuff by the way, as it allows you to make your art very detailed. ~When using glitter on a set of nails, I always do the glittered nails first. 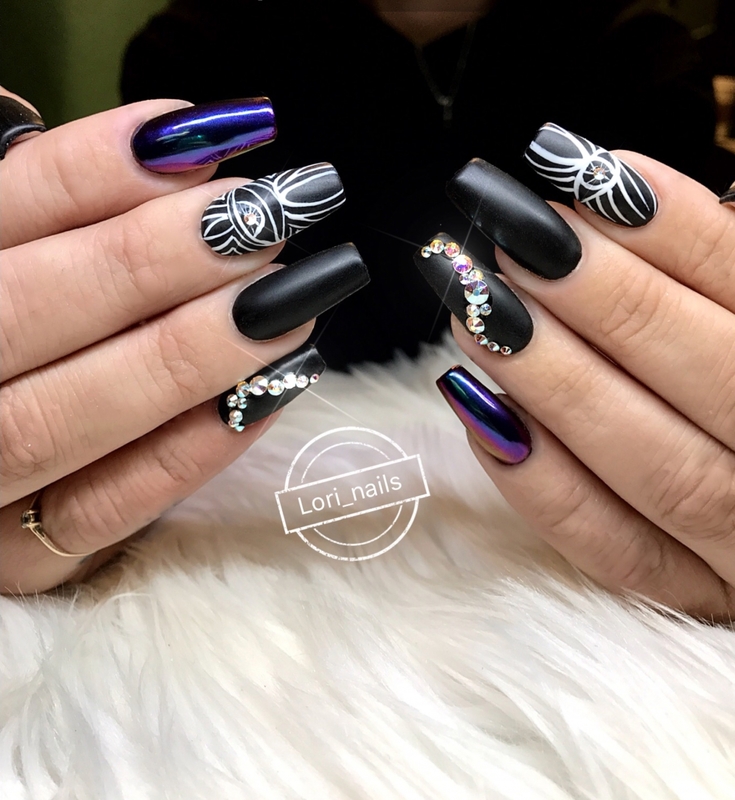 this way, you wont have glitter flying onto other nails while they are wet. 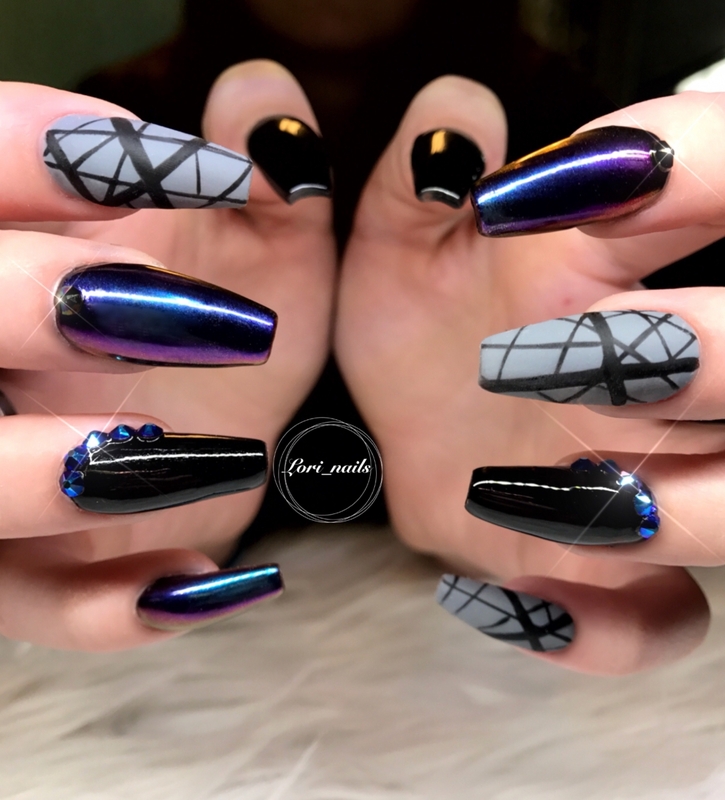 ~ I started by applying a clear Gelish top it off top coat to 1 hand at a time, so the clear doesn’t shrink back away from the sidewalls of the nails. If this happens, I just re apply the top coat. 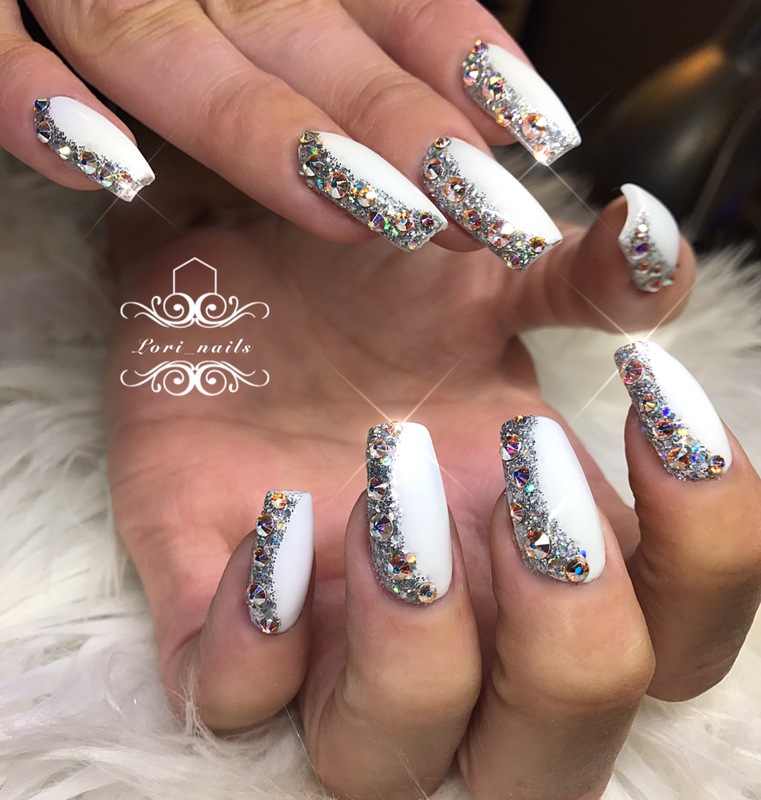 while the nails are wet, I place a sheet of paper under the nails and lightly sprinkled the slate glitter to the tip of the nails. 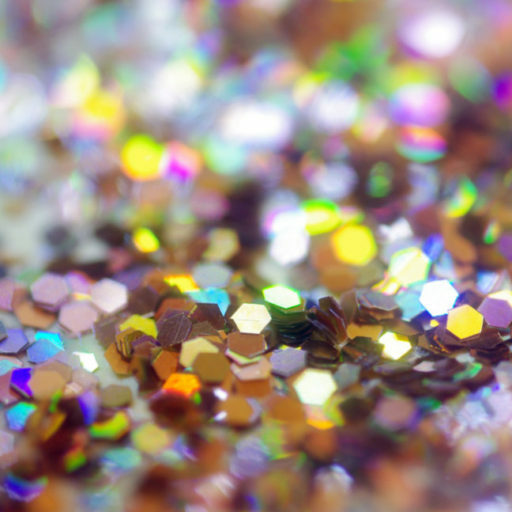 The excess glitter is then poured back to the container. 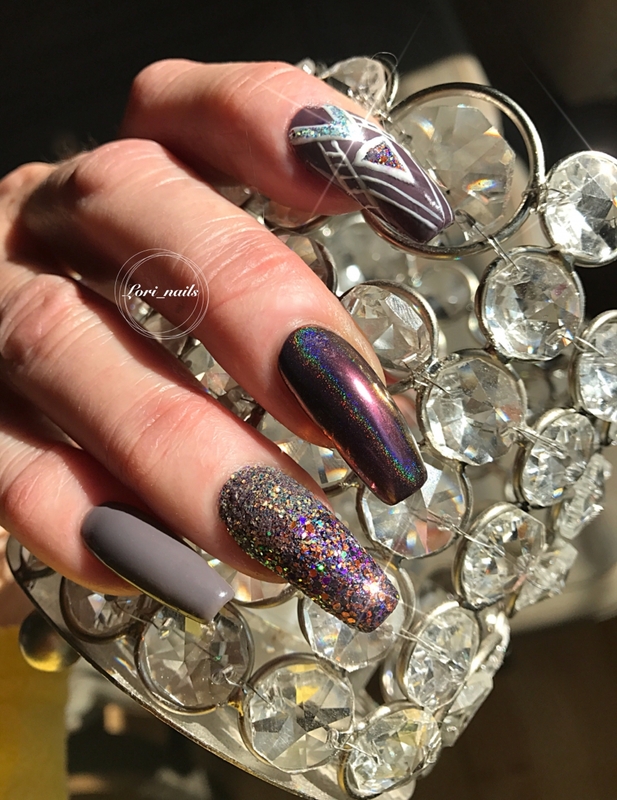 Now I sprinkle the silver glitter towards the cuticle area, slightly covering the slate glitter. I lift and point the hand downward, and tap off the excess glitter, allowing the colors to blend. ~Next, I lightly press the glitter down with my finger, to try and get a smooth surface. Be careful though, the gel is still wet underneath the glitter. Now its time to cure. 2 minutes for a UV, or 30 sec. for LED. 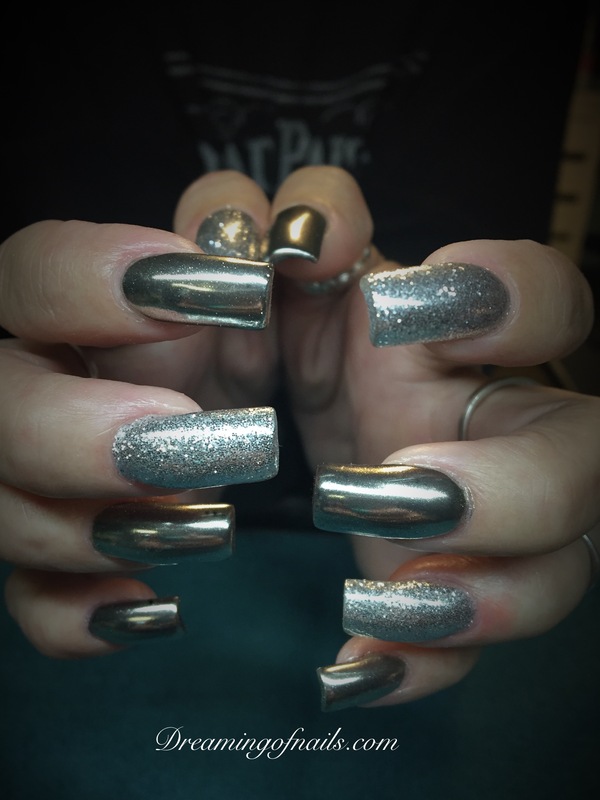 ~ Brush excess glitter from fingers, apply a top coat and cure. 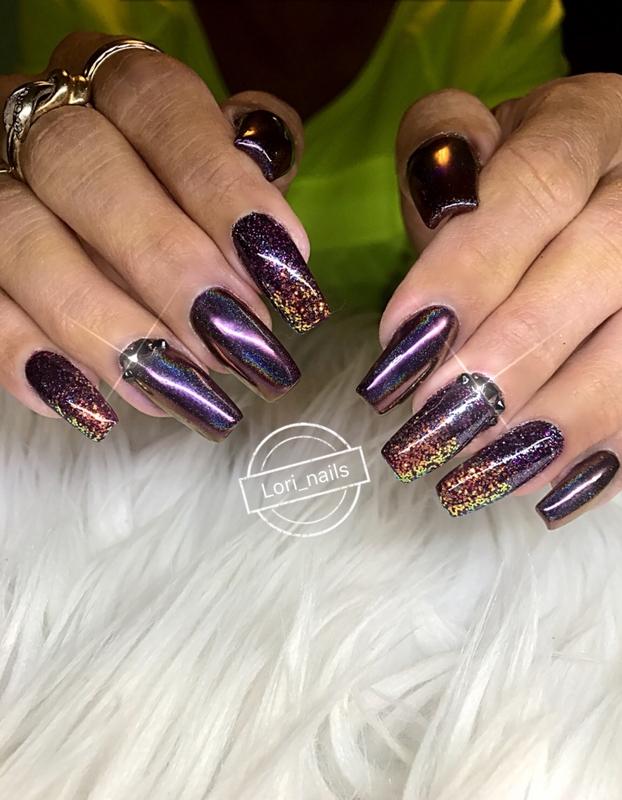 ~Use alcohol to swipe the tops of the glittered nails to cleanse. They will feel rough, so I use a block buffer and smooth out all of the grit. Now, polish the remaining nails with the white and cure, and repeat. 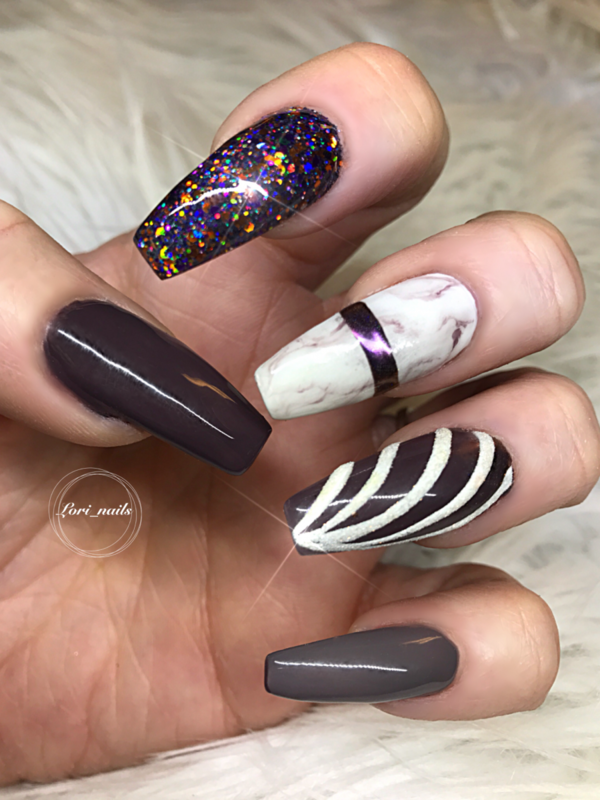 When the white is cured, use silver gel polish to make random leopard spots on the white nails and cure. Then, using a fine art brush, (an eyeliner brush works great!) dip into art gel and outline the spots. You can also add tiny dots between the spots. There’s no right or wrong way to do this, just play with it. Then cure. ~Finally, When all of the art is done, Top coat and cure! 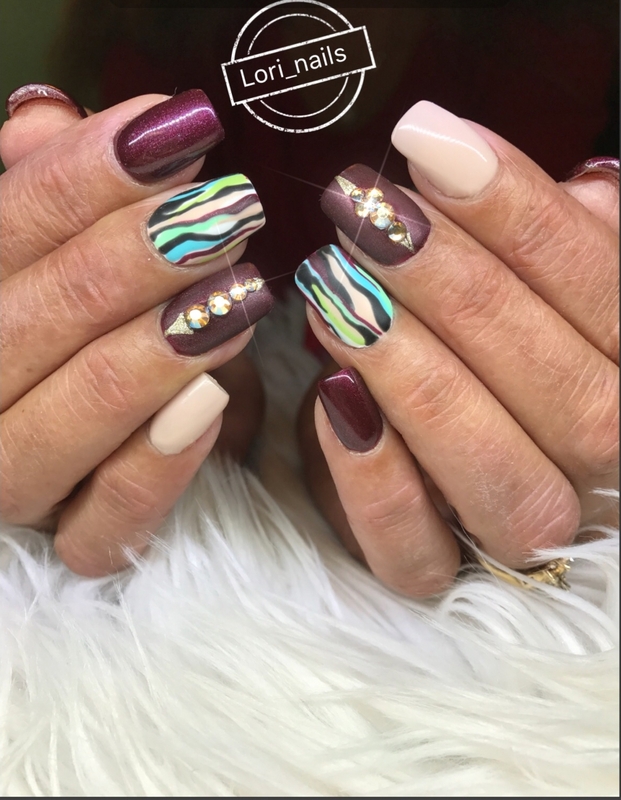 What is your favorite way to wear animal print nails? I love feedback, so feel free to comment! Thanks so much for giving everyone an extraordinarily spectacular chance to discover important secrets from here. It is always very enjoyable and full of a good time for me personally and my office mates to visit your site at a minimum 3 times a week to see the new issues you have. And definitely, I am also usually amazed with all the beautiful hints served by you. Selected 3 tips in this post are truly the simplest we have all had. I want to show my passion for your kind-heartedness for those people who should have help with the niche. Your real dedication to passing the message all through appears to be wonderfully significant and has usually empowered individuals like me to get to their desired goals. The valuable help and advice can mean much a person like me and further more to my peers. Warm regards; from everyone of us. 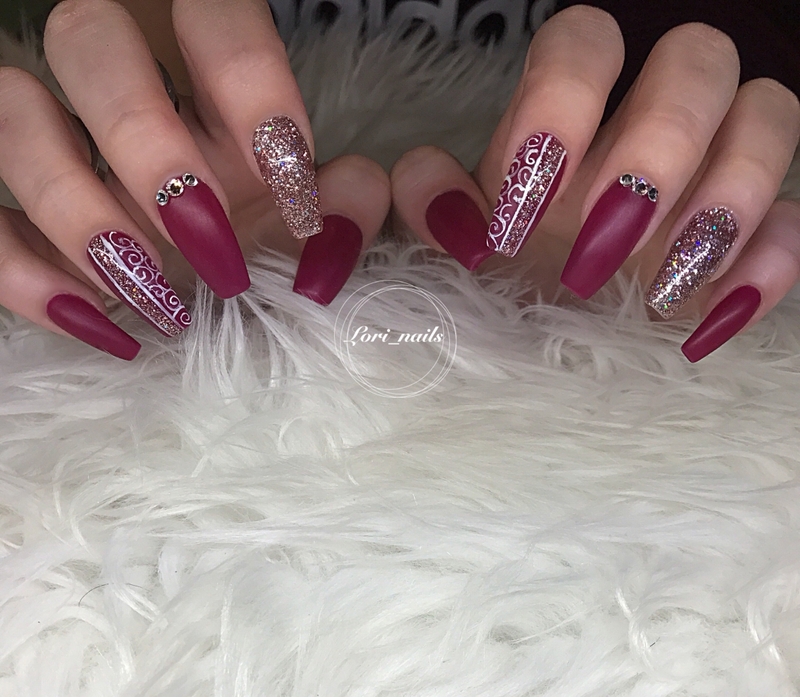 Cute 🙂 I’m a fan of glitters but usually I avoid having glitters on each nail (too shiny). 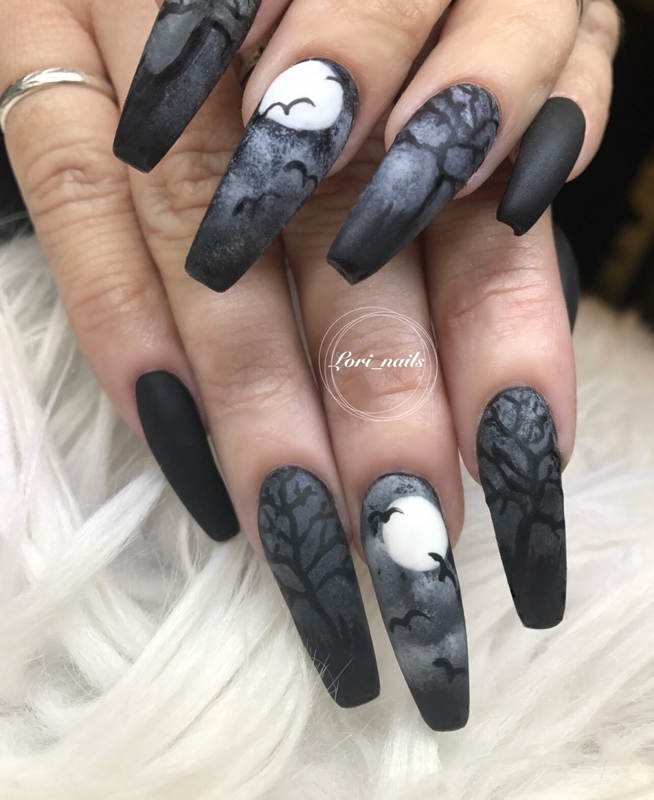 That’s why I like an accent nail(s). 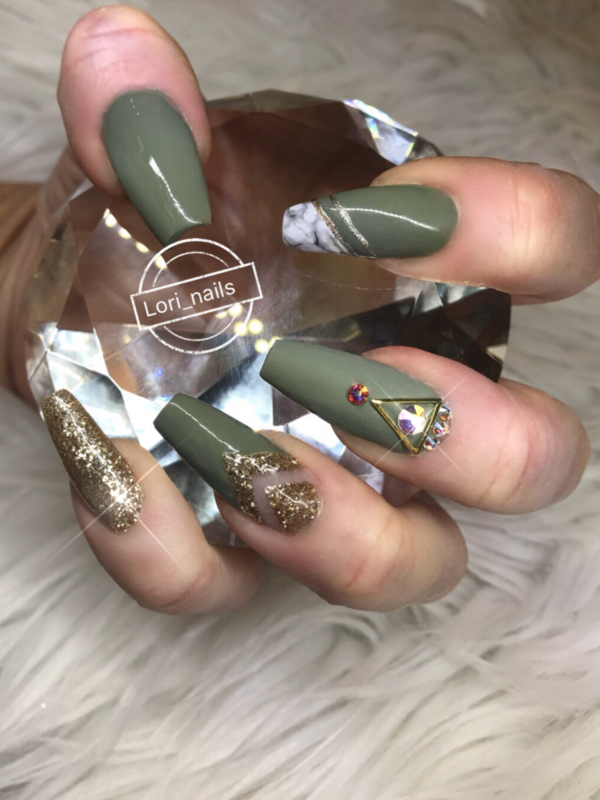 Accent nails are wonderful! They can be subtle or outrageous, without being too much.